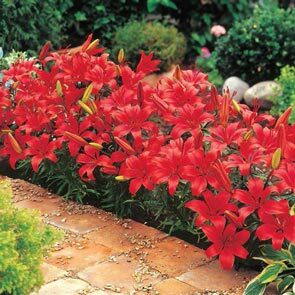 Roll out the red carpet for guests with these gorgeous Red Carpet Border Lilies. Vivid fire engine red 5- to 6-inch blooms boldly spread forth atop sturdy stems and lush dark green foliage. The buds of these Asiatic lilies are yellow before they open, bringing even more colour to your early summer flower garden. To bring this beauty to your outdoor space, begin by burying the Dutch bulbs about 6 inches deep and 9 to 12 inches apart in an area of well-drained sandy, clay or loamy soil. Water these growing Asiatic lilies thoroughly in the off season. The flowers thrive in both sunny and semi-shaded conditions, in a hardiness zone between 3 and 8. When fully mature, Red Carpet border lilies will be about 15 to 18 inches high. 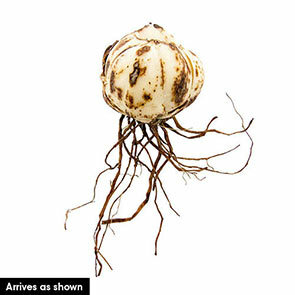 These perennials are several inches shorter than most other Asiatic lilies, making them ideal for a border around a flower garden or along a pathway. By the time these flowers bloom, most lawns will be fully green, and the darker colour serves as a very effective background. These lovely flowers also look great in mixed beds. Compliment pastel flowers with these scarlet lilies or create a riot of colour with yellow and orange companions. Revel in summer colour with Red Carpet border lilies.